Around 9AM, I had a nice walk around the neighborhood. A light breeze carried the scent of honeysuckle and cedar, I caught a whiff of paint as someone spruced up their house, and the smell of freshly mown grass was everywhere. Hot rubber tire odor crept out from under a pickup while the metal of the engine ticked as it cooled — someone had just come to visit? A barking Min-Pin fenced in a nearby yard made sure I kept moving along. The neighborhood was a good place to be this morning. 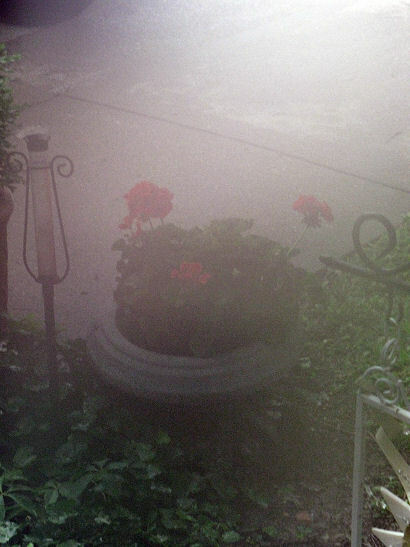 This picture doesn’t show fog-in-the-air, it shows condensation-on-the-lens. 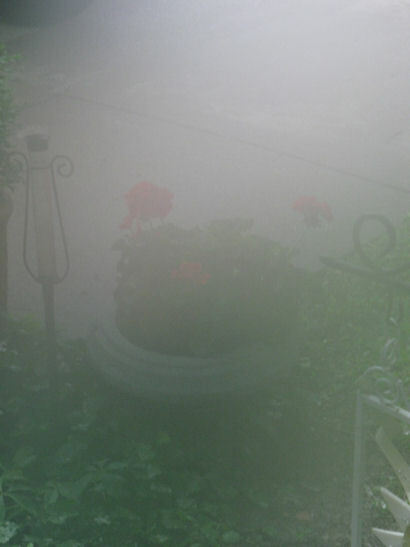 The cooler lens of the camera was fogged beyond useful pictures by the moisture in the air. By the way, the picture is of a geranium in a planter. I hope this steam dissipates by the time I go out for my walk tomorrow morning.